What a well run, well maintained and low-carbon footprint site. Ian and Julie the owners were very friendly and helpful. The shop run by Julie is well stocked with lots of tasty and locally produced food as well gifts though no 'tourist tatt'. The site is well laid out with plenty of space between pitches and the magnificent beach only a five minute walk. If you do run out of essentials (like wine!) 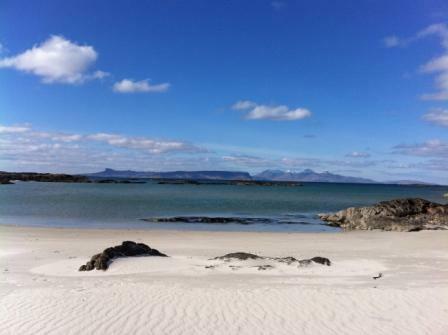 the SPAR in Arisaig is a an hour's walk, or less if you don't keep stopping to admire the views. Sunsets are really spectacular. The hi-tech, low energy 'facilities' block is amazing and worthy of an award. 0 of 14 found this review to be helpful. 0 of 15 found this review to be helpful. Add your review to Sunnyside Croft Touring Site with the form below. Have just returned from a wonderful five day visit the Sunnyside Croft. Having been there 3 times within its first 3 months of opening we were a little concerned that standards might have slipped but we needn't have worried. Ian and Julie were there to give us the usual warm welcome and everything on site including the facilities block is still of the highest standard. We felt as if we had come home. 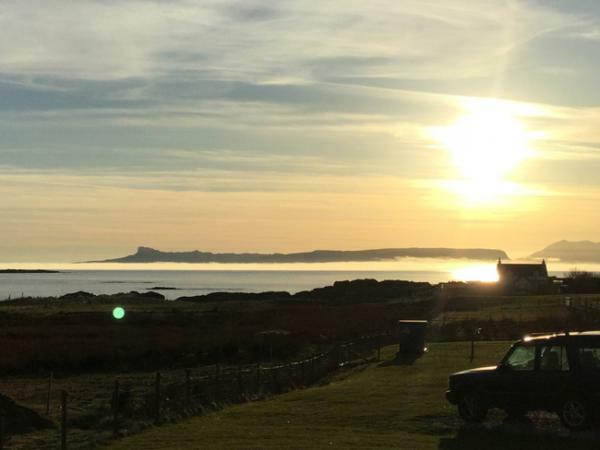 As the only site officially open in the area we had a few neighbours on site all of whom, like us were searching for peace, quiet, stunning views and hopefully a bit of good weather, none of us were disappointed ! Never saw a drop of rain, only a gentle breeze on the odd occasion and the sun shone for a full five days and yes we do mean in February ! 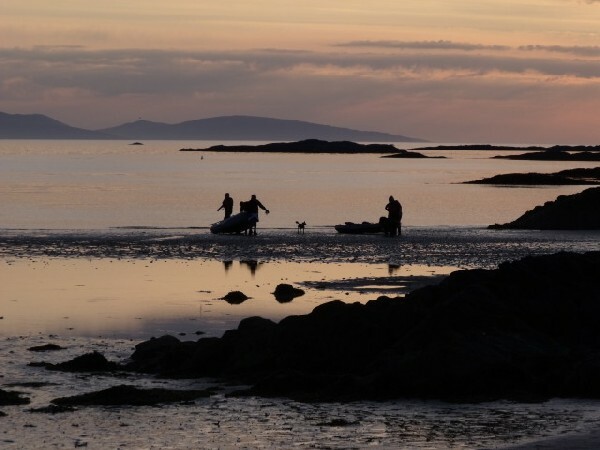 Enjoyed some wonderful walks Morar Beach, Camusdarach Beach and had a few late night BBQ's and campfires on Bunacaimbe Beach which is next the the campsite. As always the sunsets were a sight to behold and I even had a late night paddle. Feet have never felt so good. Have visited this area many times over the last 15 years and we will continue to do so safe in the knowledge Sunnyside will be of the standard we have come to expect in our later years of campervaning. We can't wait to return. 10 of 30 found this review to be helpful. Thank you for such a lovely weekend- the facilities and owners are a cut above the rest, just wished we could have stayed longer. We will be back. 5 of 24 found this review to be helpful. This site has very clean and modern facilities, well thought out (even an outside shower for rinsing sand off when returning from beach).Beautiful location.We appreciated a curfew of 11pm, our kids were exhausted and ready for shut eye, which gave us some quality time, recommended this site to friends and will definitely be back. 5 of 21 found this review to be helpful. Lovely little place with nice staff, a lovely view and great, modern facilities. Better as a stop on a tour than a holiday in itself but very nice. 2 of 19 found this review to be helpful. 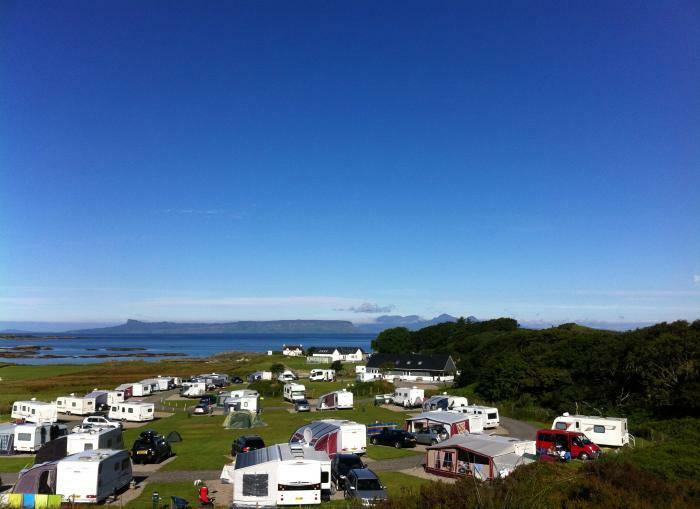 This is a site geared for motorhomes and caravans in the main. A lot of stones everywhere on the site ideal for vans but not so good for tents. The paths are very sharp stones not great for walking on or for children falling although this could be a deliberate deterant to stop kids running about. Facilites are very clean and fastidiously maintained. Better suited to older couples or very small children. Be careful to read the terms and conditions as they are enforced . Note no balls or kites and curfew at 11.00 pm. Not great for groups or anyone wanting the laid back west coast camping experience other sites in the area are better suited for this. This site would suit those looking for a quiet and very clean campsite. 4 of 26 found this review to be helpful. Just back from a four night stay in caravan. This is a LOVELY, well thought out site. Ian & Julie have, very obviously, spent time and spared no expense getting the site just right for different types of campers. Facilities are the best in the area. No question. Toilet block has dedicated areas for families & disabled - nice touch. Gents was immaculate. Three showers (included in site fee) all spotless. Three also in ladies and three toilet cubicles. Information boards kept up-to-date and well-stocked with literature. For people in tents, (we used to do tenting), the pitches looked fairly level. Facilities included a microwave(! ), a freezer for your ice packs and a large undercover seated area that you could comfortably eat at, or just read a book. Hot water was provided and the dishwashing area was also under cover. (Separate from seated area.) There is also a laundry & book swap area. The caravan pitches are hardstanding and you really need to make sure you have "manly" tent pegs if you want to put an awning up. (Pack of twenty available at shop.) Shop stocks locally produced treats and gifts along with a few basics. Seemed to be reasonably priced. A good idea is what they call a "Pit-ch stop" where you can use the facilities for a small fee. 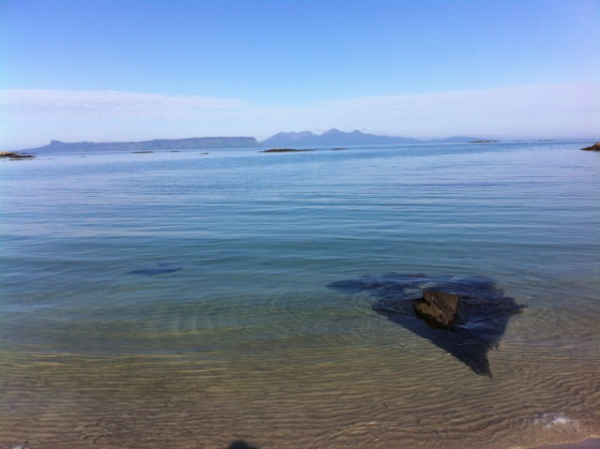 Handy if you've been on the hills, arrived in the sandy bay on a kayak, or simply want to pass through on the way to/from Skye in your campervan. The family who run it are most helpful and friendly without being overbearing. You will not be disappointed if you turn up at this site in whichever outfit you have. We have been all over Scotland and have to say this is one of the best sites we have visited. (The area, which is spectacularly beautiful, needs no description in this review.) The owners have created a site that they would be happy staying at. It is clean & modern without losing the ambience of the area in which it is situated. Frankly, other sites need to pull their socks up and take a look at this example of how a campsite should be run in 2012. Thanks guys, we'll be back. 13 of 15 found this review to be helpful. Stayed here for 2 nights in our motorhome in July '11. Very welcoming especially to our 6 & 4 year olds, who had their "own" little one's bathroom, which was immaculate by the way. Pitches for caravans/motorhomes are large (7 X 10 m I think) and we were told we could park which ever way we liked for the best view, which was spectacular. Less than 5 min walk to lovely clean beach, gently sloping beach, great for children paddling and loads of pools and rocky bits for exploring. Elec cards great, Less than £1 day for us and can buy them 24/7. Would Definatley revisit, only 1 tiny itsy bitsy gripe was the road was quite stony because it is new and difficult for our children to cycle on, expect it will be smoother by the time we go next! 11 of 12 found this review to be helpful. Just arrived back from a five night stay at this superb campsite. Nice to travel up on the new road. Found the owners very helpful and well clued up on the area even though they aren't locals, to be honest I think they were slightly taken aback at how popular their campsite had become within a week of opening! For the first two nights there was no hot water but I was made aware of that before booking in and decided to stay anyway and I'm so glad I did. By day three hot water was available so I didn't get too smelly! The reception, shop, toilets, laundry, dishwashing area, cooking area and seated eating area are all under cover which is well appreciated ( particularly by tent dwellers I would imagine) in this area as the weather can be really wild at all times of the year ! The site is very well set out with tent pitches in the middle where you can park your car next to your tent. 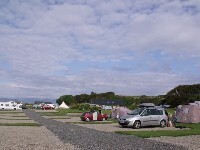 Caravans and motorhomes are on the very roomy outside pitches. Electricity is available for all pitches and is by £1 card that you purchase from a machine in the facilities block. I used just under a fiver for the five nights I was there. The toilets and showers are all newly built and very clean. The shop has lots of lovely produce, if you like to BBQ you really must try the burgers, sausages and the veg and chicken Pakora. The vanilla ice cream for afters is to die for also. I local van comes round on a Tuesday afternoon with some excellent produce so if you want to park up for the duration of your holiday rather than go into town for supplies this could be a good set up for you. Of course if you really need to there is a well stocked Co op and Spar shop in Mallaig (good for topping up your wine supply !) 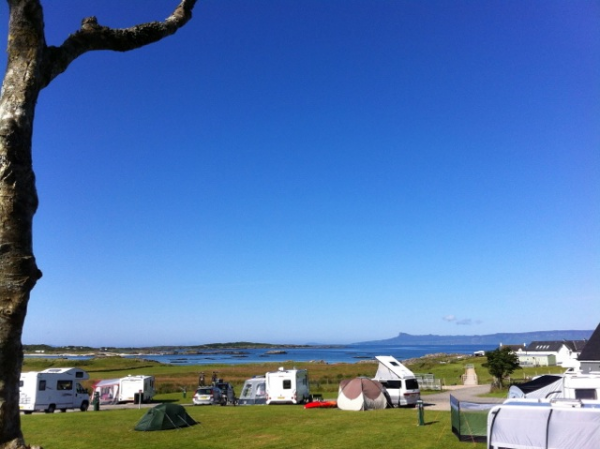 You have access to many beautiful beaches from both this campsite and throughout the area. 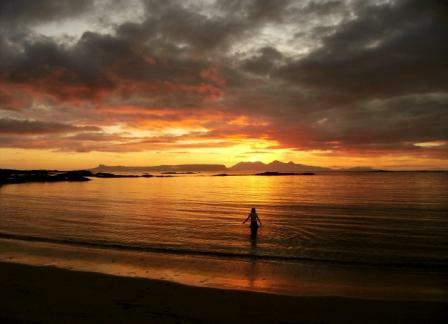 Morar beach and Camusdarach beaches are a must to visit. Ideal area for canoeing. 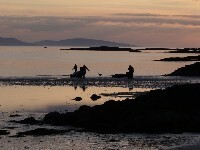 Kids will love messing about in the sea and the Rock pools. Photographers will be spoiled for choice of locations to get good shots. All in all, a stunning area and a campsite I felt settled and welcome in. I would gladly return, in fact I liked it so much I bought a the T-shirt which is also available in the shop ! 23 of 24 found this review to be helpful. After a really long wait the all singing and dancing Sunnysidecroft Campsite is now open. Had a few nights stay and I must say it does live up to the websites promise of a 21st century campsite. On arrival you will be welcomed by friendly owners who are on hand to advise you on all the local ammenities . In the reception area which doubles as a small very well stocked shop, you will be able to buy locally sourced produce as well as the all the basics. The pitches are spacious and well thought out. Unlike some other sites in the area, its nice to have a dedicated pitch thats yours for the duration of your stay. The facilities block is one of the best I have ever used. Family bathroom and disabled facilities are available. Had a sneaky peek at them and they really are top spec. A campers kitchen complete with covered dinning area, washing up facilities and microwave for cooking is a godsend for campers in bad weather as well as a good meeting place for folks to socialise. For those who need internet connection, my Vodafone dongle had a slow but constant connection but you do have the offer of connecting to Highland WiFi if you are desperate. Most phone networks connected ok. No EHU tariff here, you buy electricity cards which means you pay for the electricity you use rather than paying for the hire of an EHU , a lot fairer I think since I only used 95p of electricity in 24 hours. Bunacaimbe beach is just a short walk away and the sunsets have to be seen to be believed ! Back to the facilities block, there's also a laundry room boasting a washing machine, tumble drier and ironing facilities. Of course this area is all about the views and oh my gosh is there views from the elevated pitches here, totally stunning ! 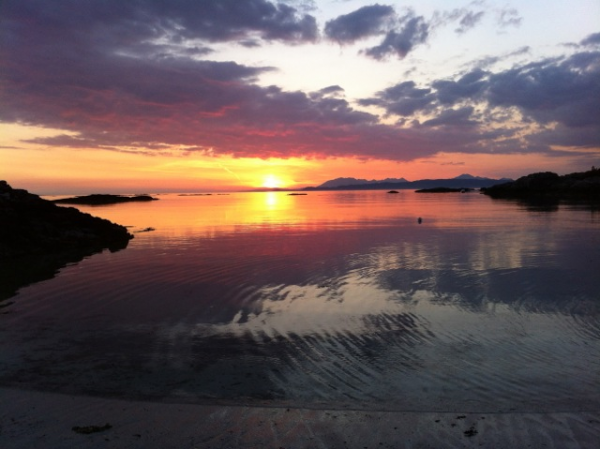 All in all, a smashing modern site that makes you feel welcome and is a good base to explore the Highlands and the Islands. 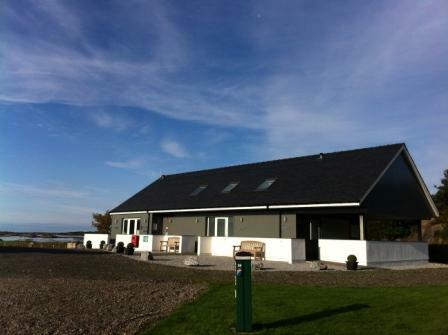 Of course if you are to long in the tooth for camping and caravaning you could always make use of the first class self catering lodge and static and if you want breakfast included, there is a fantastic B&B available Will most definately use this site on a regular basis. 5 stars all round ! A long time coming but Ian & Julie have got it just right. 31 of 34 found this review to be helpful.